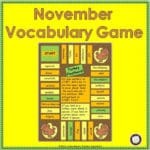 Teaching November vocabulary can be so challenging! 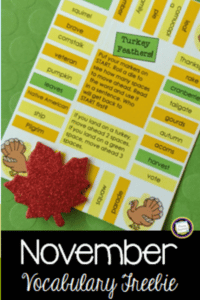 November is such a busy month in school, packed with concepts and lots of “big words” that need to be taught, like election, veteran, and all the special words for Thanksgiving. There’s just so much Tier 2 November vocabulary for our young students to master. What’s your favorite way to introduce new content area vocabulary to your class? Actually, introducing Tier 2 vocabulary is really not that much different than any vocabulary you introduce – the important thing is to keep the words in context! One of my favorite ways to introduce words in context is through read alouds. I love to start with simple books that kids can make some text-to-self connections with. Those connections provide a “hook”, something to attach their new learning to. Hearing the words in a read aloud and using them in discussions needs to precede seeing them in print. Here are two of my favorite books to use to start introducing Tier 2 November vocabulary. What is kids’ favorite thing to read about? It’s pretty much a slam dunk that the answer to that question is other kids! One Little, Two Little, Three Little Pilgrims, written by B.G. Hennessy and illustrated by Lynne Cravath, is filled with charming little kids doing the things that little kids do… or at least what they did in the 1600’s, but they’re still relatable! This what I call a book-that’s-a-song-that’s-a-book. Coming right on the heels of singing “One Little, Two, Little Three Little Pumpkins” in October, the melody will likely be familiar to your students, so that’s another connection! Plus, knowing the words to the song + a few repeated readings will be just the support that’s needed to make this book readable for even your newest readers! In case you’re wondering, this book does not use the word “Indian”, but instead uses Wampanoag. Here’s the content area vocabulary in One Little, Two Little, Three Little Pilgrims. There’s an informative section of notes from the author at the end of the book, including the fact that she worked with the research director of Plimouth Plantation in gathering information for this book. So, what’s kids’ second most favorite thing to read about? Dogs would certainly be high on the list! They’ll love Friendship’s First Thanksgiving, written and illustrated by William Accorsi, told in the first person by Friendship, a dog who “traveled to the New World with the Pilgrims on the Mayflower”. Here’s some of the Tier 2 vocabulary that you can introduce with this book. Squanto and Samoset are also mentioned in the text. And I’ll bet you’re wondering if there was actually a dog on the Mayflower. Apparently, the answer is yes, likely even more than one dog. A piece written in 1622 relates that a mastiff and a spaniel were present for early exploration during the first winter in New England. Just as a heads up, this book does use the term Indians and also makes several references to giving thanks to the Lord. I’ll leave it to you to handle this with your own professional discretion. Personally, I read the book as written and then have some discussion about the terms Indian and Native American. It’s a good point in time to show students how to find out when a book was written and to discuss how the words we use sometimes change over time. I’ve had some really great discussions with first graders on this topic. 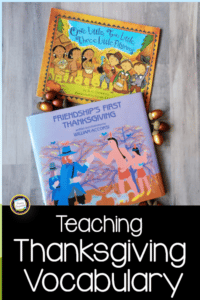 You can find more about these books here, plus you’ll find a link there to a set of free reading and math extension activities to use with Friendship’s First Thanksgiving. 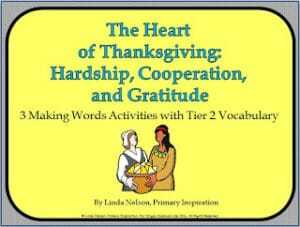 If you’d like to give your students even more practice with November content area vocabulary, click here or on the picture at the top of this post to download your copy of Turkey Feathers. It’s an easy-prep one page game that’s an ideal way to integrate reading and social studies. 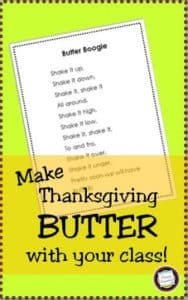 Making and Shaking – Thanksgiving Butter!